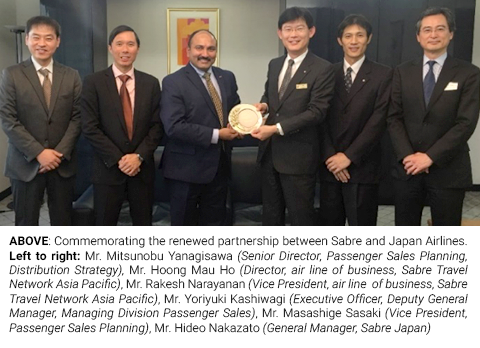 SINGAPORE –29 March 2018 – Sabre Corporation (NASDAQ: SABR), the leading technology provider to the global travel industry, today announced a renewed long-term agreement with Japan Airlines, marking the continuation of a strategic partnership between the companies as Japan Airlines increases their global footprint and caters to the country’s fast-changing travel industry. Tourism in Japan is undergoing a rapid transition with over 28.7 million inbound visits in 2017 . As Japan Airlines faces robust domestic and international demand from consumers, it continues to stay focused on delivering its brand promise and providing the very best travel experience to its passengers. Under the renewed agreement with Sabre, the airline will have the capacity to leverage Sabre’s group booking tools for the first time, providing the necessary support to manage their high-volume of group business. Access to Sabre’s innovative solutions will help drive efficiency and expand the airline’s reach by empowering Sabre connected agencies to promote its content with groups. Travellers globally will now have more options to book their travel on Japan Airlines with their trusted agencies. Japan Airlines (JAL) was founded in 1951 and became the first international airline in Japan. A member of the oneworld® alliance, the airline now reaches more than 344 airports in 56 countries and regions together with its codeshare partners with a modern fleet of more than 230 aircraft. JAL Mileage Bank (JMB), the airline’s loyalty program, has reached over 31 million members worldwide. Awarded one of the most punctual major international airlines, JAL is committed to providing customers with the highest levels of flight safety and supreme quality in every aspect of its service, and aims to become the most preferred airline in the world.